Breadcrumb version: Put breadcrumbs in a large bowl and dribble with milk or water to rehydrate. Add the ground turkey, Pecorino, parsley, egg, garlic and salt. Mix until evenly combined. Season with pepper. Using your hands, gently form the meat mixture into 1/2- to 3/4-inch meatballs (we like to pop ’em in our mouths so we make ours on the smaller side, think cherry tomatoes; you can use a cantaloupe scoop). Spread them out on a parchment-lined baking sheet, cover and refrigerate or at least 1 hour or up to 24 hours. 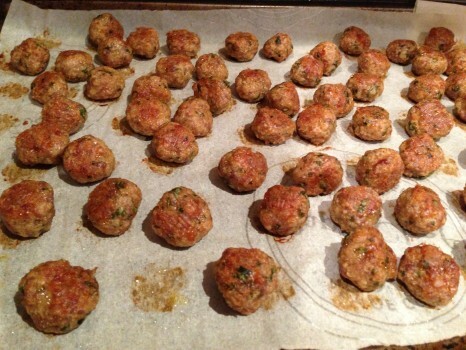 When ready to make meatballs, preheat oven to 350°F. Bake for about 20 minutes and then flip them over and bake for 15-20 more minutes, until browned. We like ’em crunchy on the outside, juicy on the inside. Quinoa version: Skip the milk/water. Mix cooked quinoa together with all other ingredients and form into meatballs. Follow the rest of the recipe (above) from there. Tonight we had the meatballs with spaghetti, tomato sauce and freshly grated Parmesan. I roasted some cherry tomatoes and eating them with the meatballs was a major taste sensation! 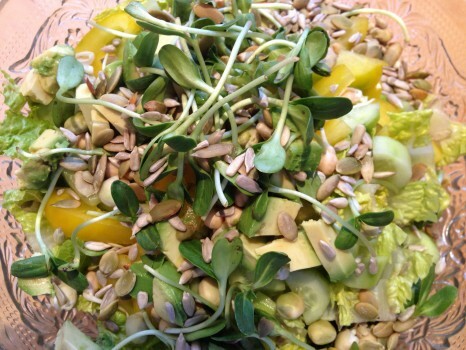 We also enjoyed this beautiful crunchy green salad with sunflower sprouts and seeds. Salad with yellow peppers, sunflower sprouts, cucumbers, avocado and seeds.